The Palace seen from the Lagoon. Piazzetta San Marco ... 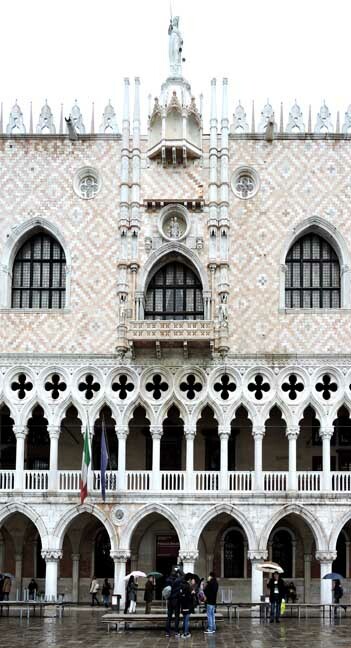 The Palace western wing, facing the Piazetta San Marco, was completed in 1450. 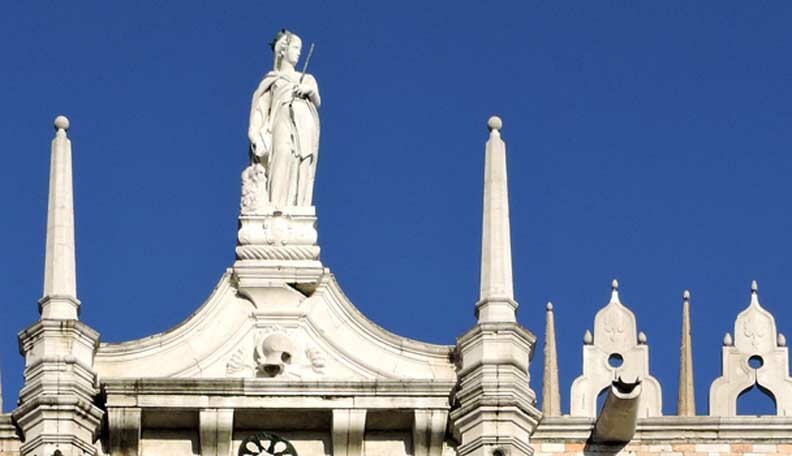 The architectural style is generally referred to as Venetian Gothic ... Left background: San Giorgio Maggiore across the lagoon. The first palace was built in 814 and was burned by the populace in 976. It was reconstructed but was damaged by a second fire; it was begun in its present form in the early 14th century. 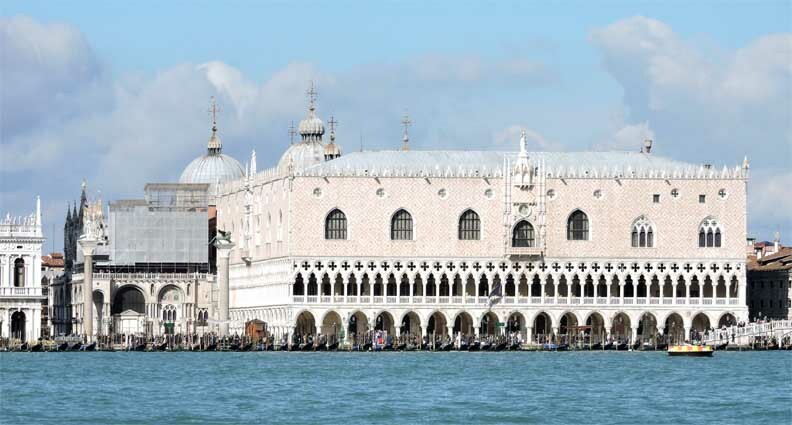 In 1424 the completion of this Venetian Gothic-style palace was undertaken, and the two identical facades facing the Molo (a broad stone quay) and the Piazzetta San Marco were extended. 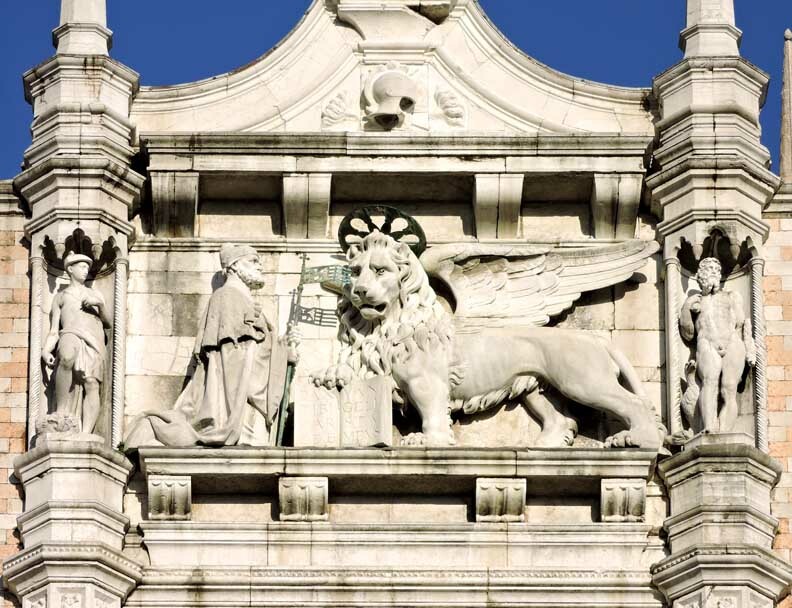 The Porta della Carta, the main gateway, was designed by Giovanni and Bartolomeo Bon (Buon) and begun in 1438. Severe fires later necessitated rebuilding parts of the palace. 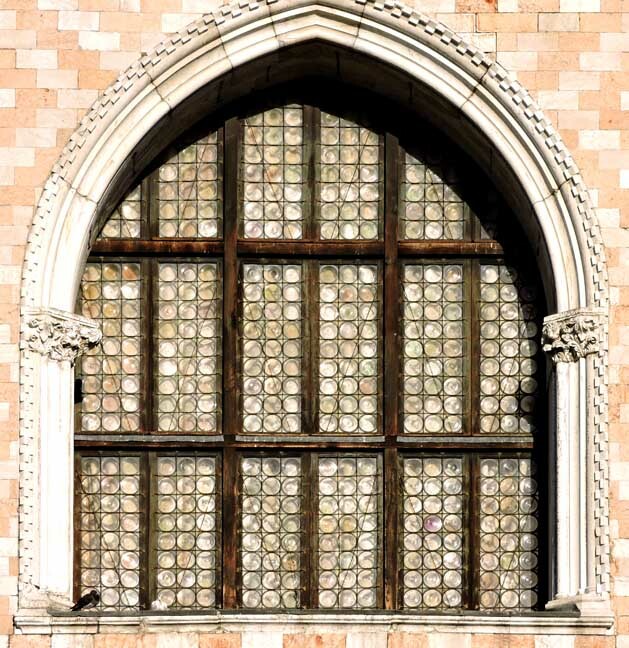 By the fourteenth century, the hierarchy of Venice decided that a grand palace was needed, a building befitting the city's new wealth and power. 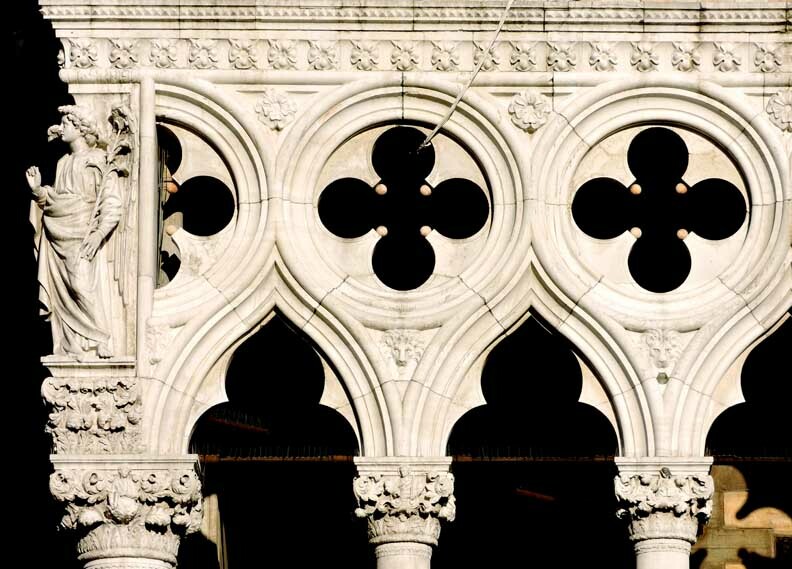 Designs for the Doge's Palace were created by Filippo Calendario (who was later executed for treason in 1355) and work on the structure began. Because of Calendario's death, the Palazzo Ducale was constructed in two phases. 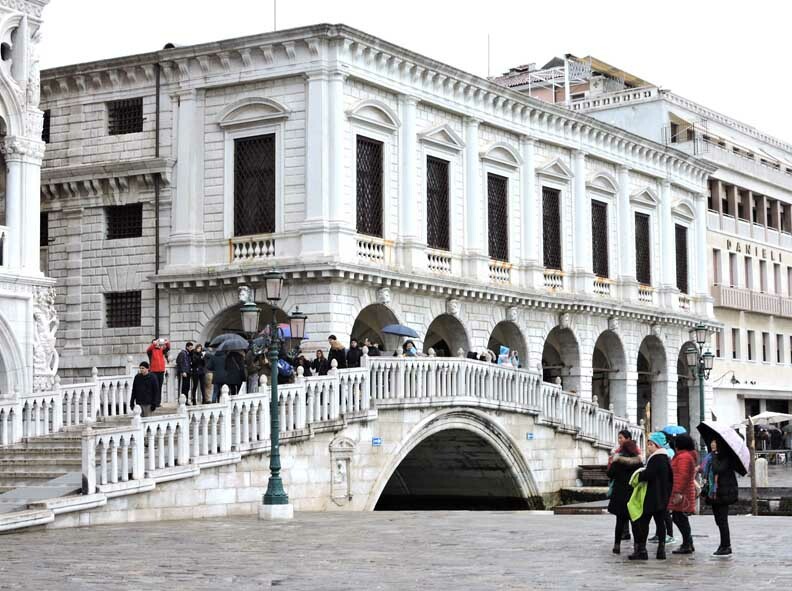 The eastern wing, which faces the Rio di Palazzo, was built between 1301 and 1340. 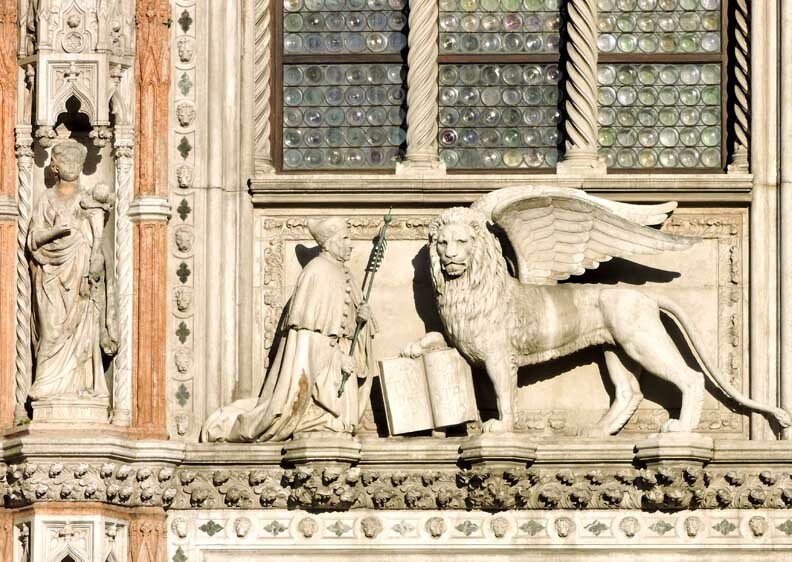 The western wing, facing the Piazetta San Marco, took an additional 110 years to build and was completed in 1450. 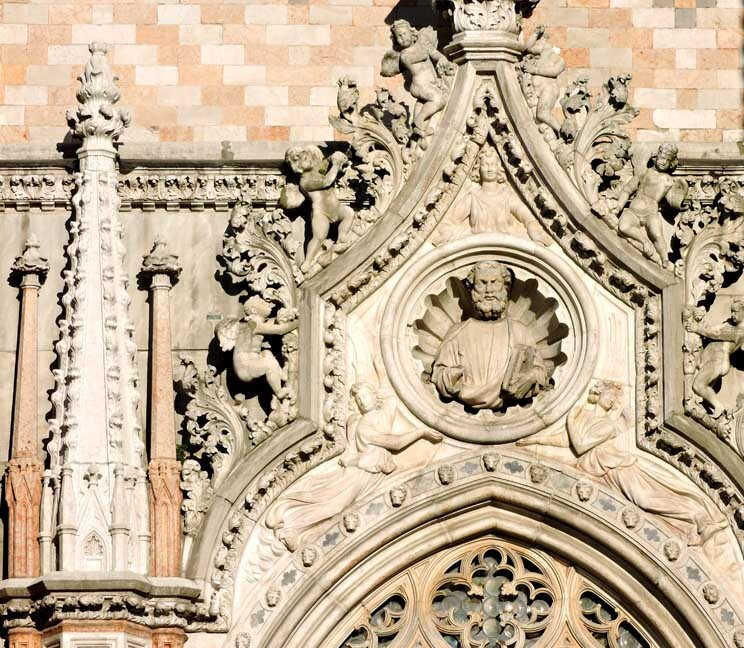 The architectural style is generally referred to as Venetian Gothic - a gothic structure with byzantine influences. Today, we think of Italy as a unified country. 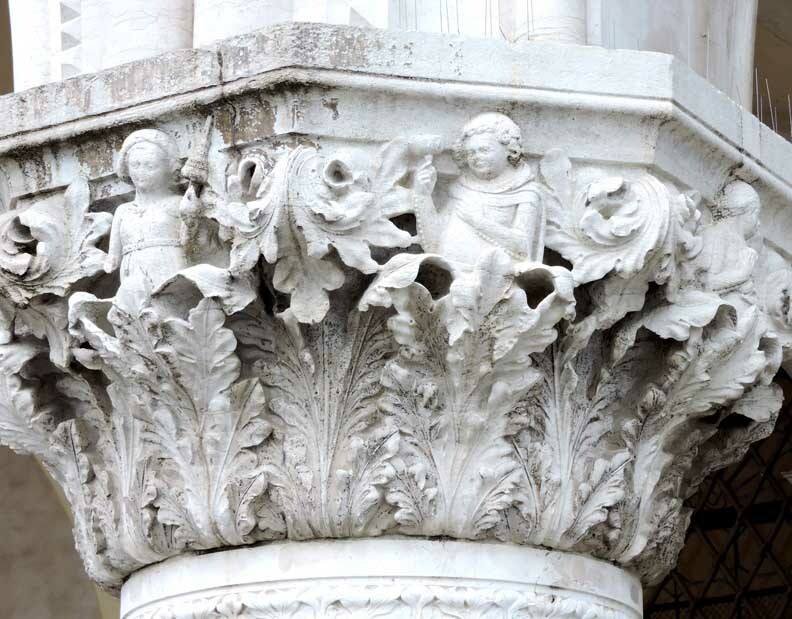 But in the fourteenth century, the major urban centers of Italy were largely unstable. Wars were common. Rivaling families sought to oust their opponents - often by violent means - and seize power for themselves. This is why so much civic architecture of the Renaissance period is imposing and fortress-like. Buildings like Florence’s Palazzo Vecchio were the standard for civic buildings in Italy well into the fifteenth century. Things were different in Venice. 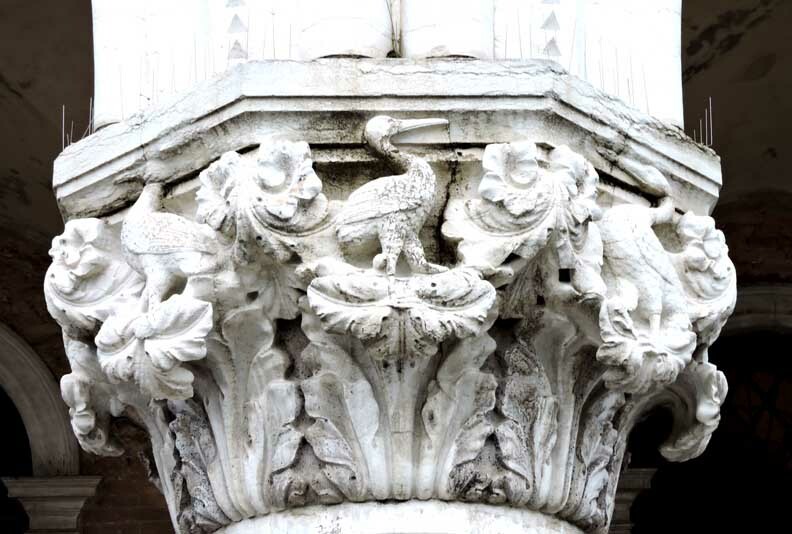 The city was politically more stable than other Italian centers, and it was also naturally protected from invasion by its favorable setting in a lagoon on the Adriatic Sea. 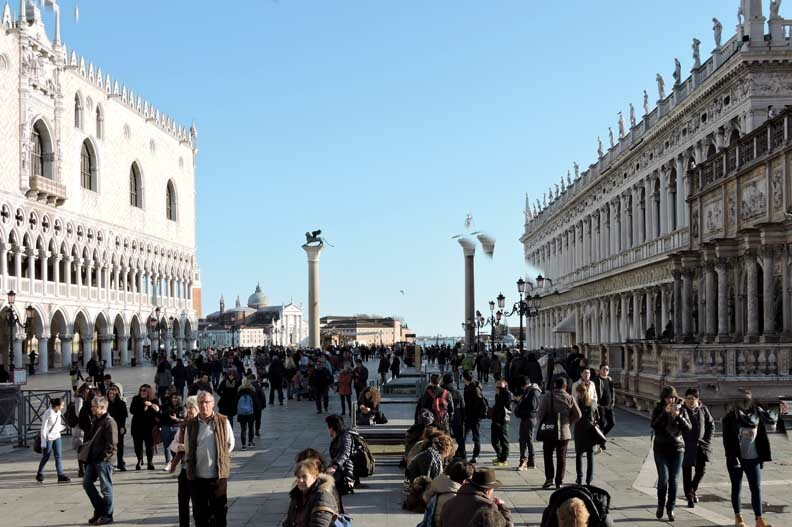 As a result, Venice’s architecture did not need to be as defensive as the architecture of neighboring regions. 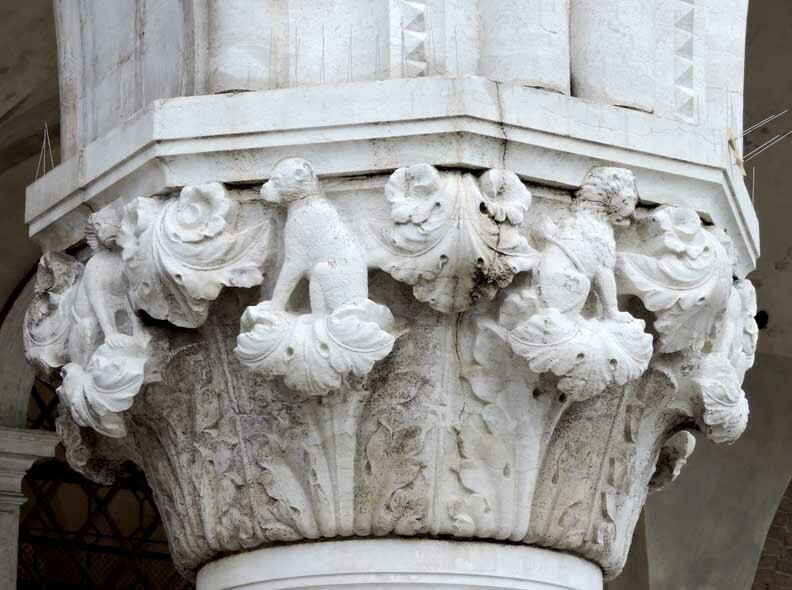 This allowed for greater experimentation in architectural form evident in the Palazzo Ducale, constructed beginning in 1340, for the elected ruler of Venice. 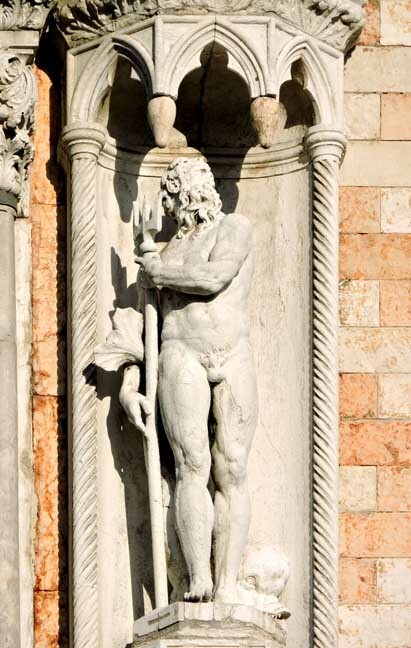 Fourteenth-century Venice was an oligarchy, meaning that it was ruled by a select group of elite Venetian merchants. The main elected ruler was called the “doge,” and his residence was - much like the White House in the United States - a private residence and also a place for official business. 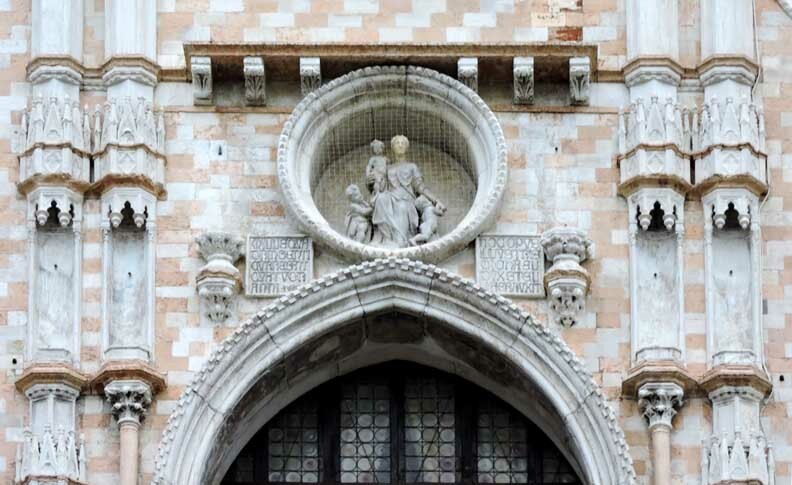 Although there was already a residence for Doge Gradenigo in the 1340s, the system of government changed afterwards so that more people were involved in governmental activities. This required more space than was available in the existing palace, the great council (a political body consisting of the nobility) voted to extend the palace. Workers began construction in 1340 and continued into the early part of the fifteenth century. 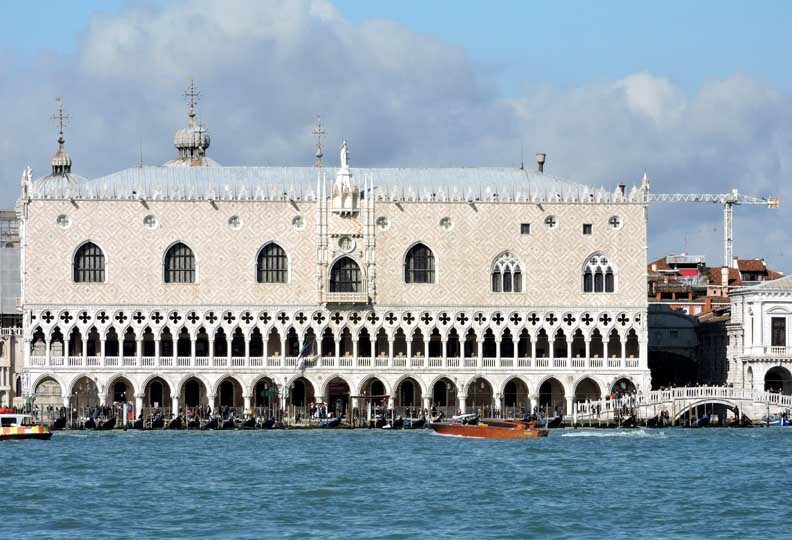 The Palazzo Ducale sits in a prominent location. 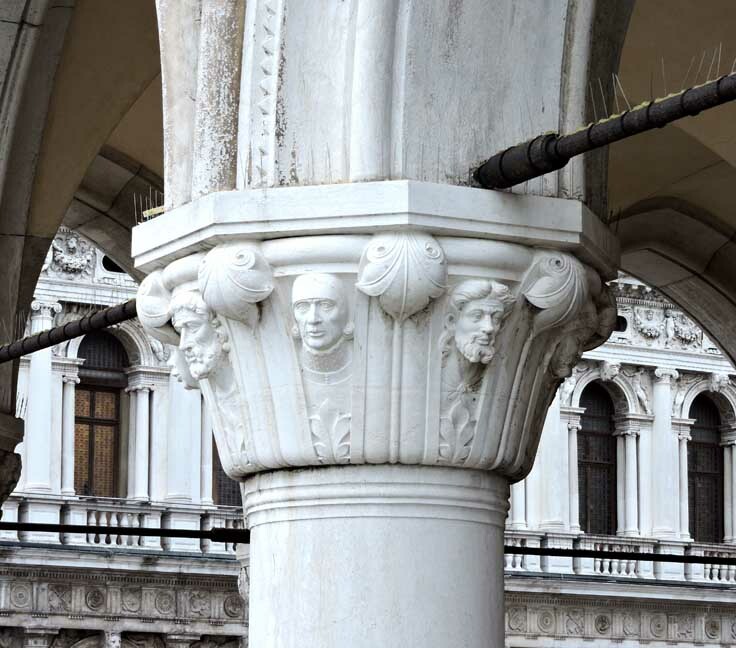 It is adjacent to the Basilica of St. Mark (Venice’s cathedral church), on St. Mark’s Square. 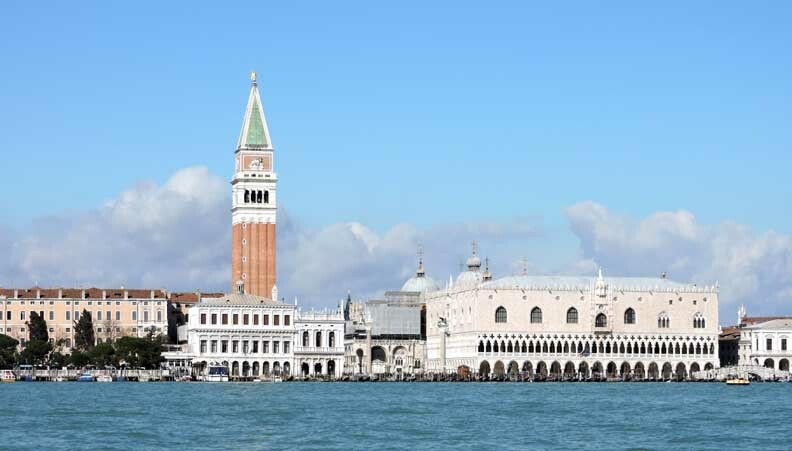 The Ducale also overlooks the lagoon, which was a major point of entry into the city. 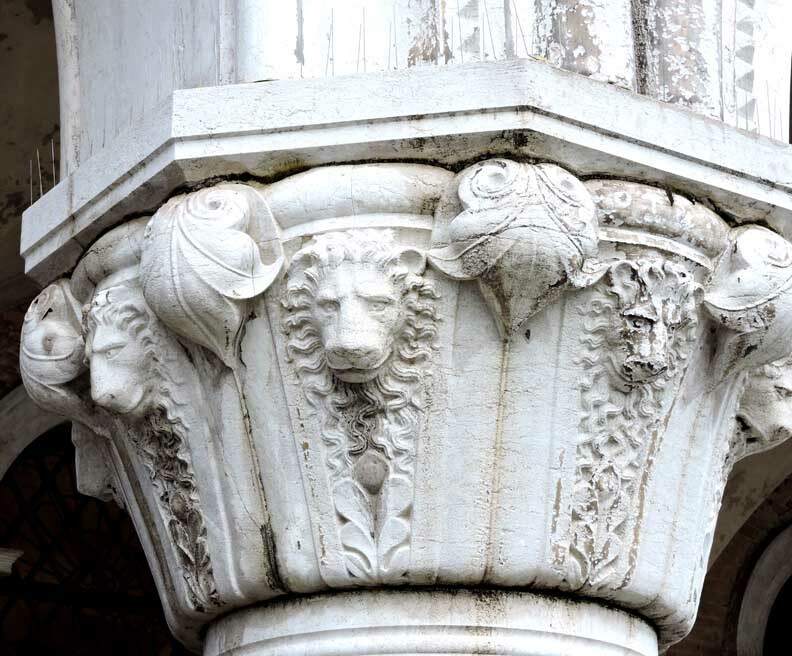 Its prominent location made it (and continues to make it) an important symbol of Venetian architecture. It offered visitors one of their first impressions of the city. The building appears delightfully open and ornamental precisely because it is able to forego many elements of defensive architecture. 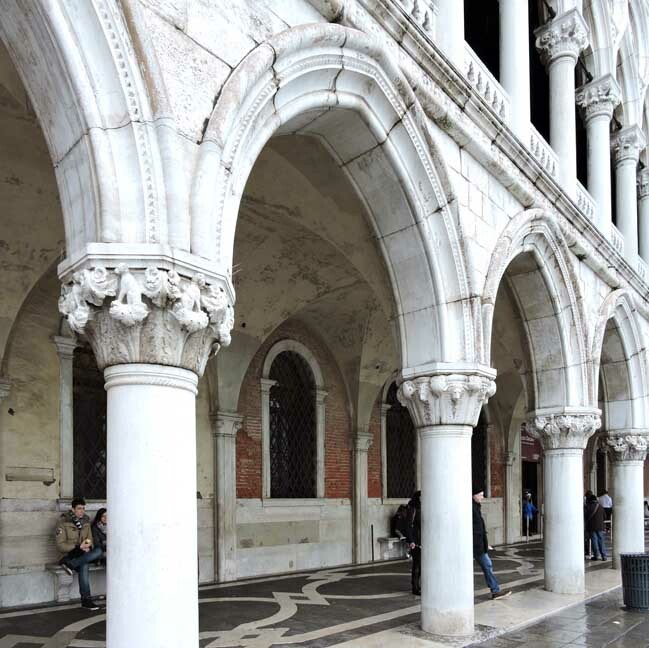 The facade includes three levels: a ground-level loggia (covered corridor) defined by an arcade of pointed arches. The second level contains an open balcony which features a prominent balustrade (railing) that divides the first and second stories. 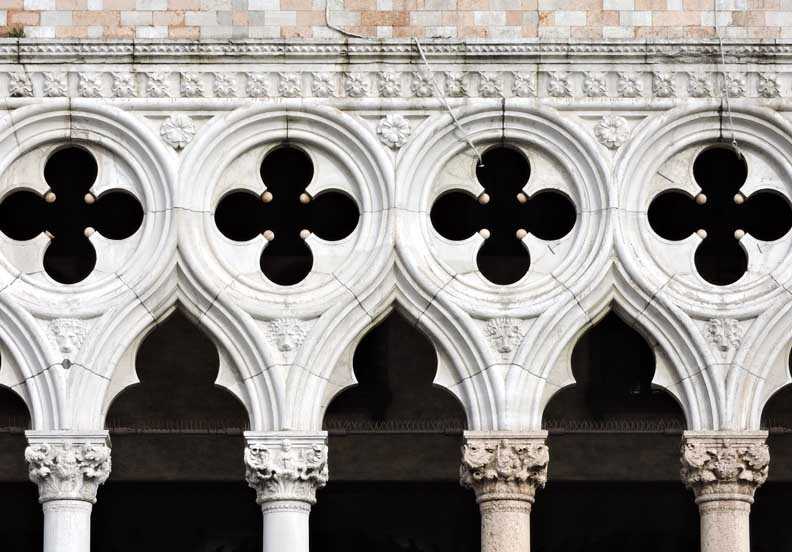 Like the lower loggia, the balcony features pointed arches, though here with the addition of delicate quatrefoils (four-lobed cutouts) just above them. A stone wall completely encloses the third and uppermost level of the facade and is punctuated by a row of large, pointed windows. 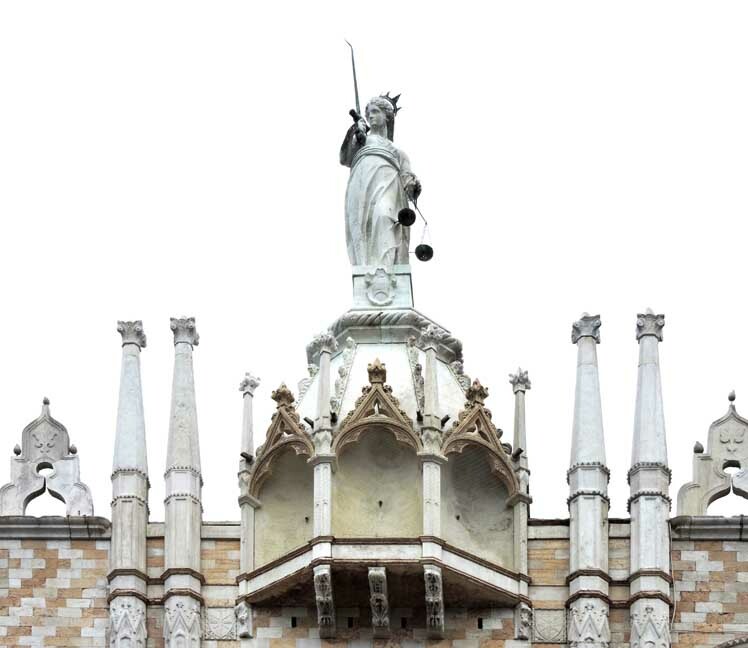 In many respectses - especially in its horizontal emphasis and three-story facade - the exterior of the Palazzo Ducale exhibits features that emerged in the Renaissance architecture of Florence during the fifteenth and sixteenth centuries. One could argue that this building anticipates those trends. 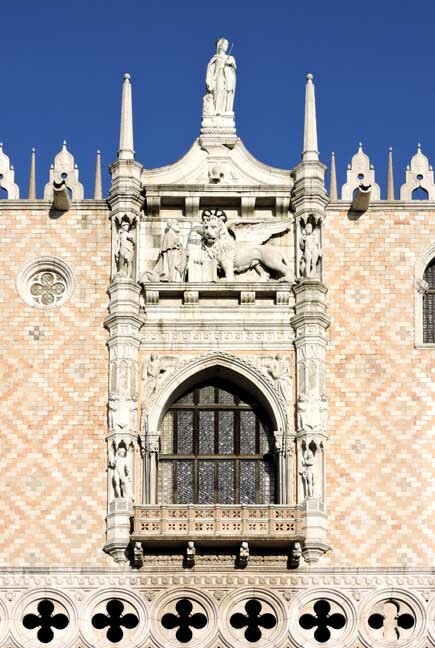 Undoubtedly, in the Palazzo Ducale, we see a degree of the harmony and rhythm that we associate with later Italian Renaissance architecture.